Have you ever noticed how customers choose a shampoo in a supermarket? About 80% of them take the bottle from the shelf, feel it, open it and smell the scent inside. In less than 3 seconds, the decision is taken to either purchase it or put it back. "90% of all purchasing decisions are not made consciously", experts claim. So, what influences the purchasing decision (other than brand/price)? In my 20 years of consumer insight research, I focused on brand/product emotionality and sensory perception. All studies I conducted had one same common challenge: emotional (sensory) consistency! In a nutshell, it was all about defining if the emotions experienced through the product sensory (smell, taste, look, feel,...) were in line with the customer's expectations. This sounds easy and obvious? True! So why are more than 75% of the new product launches taken off the market in less than a year? Getting back to the question "What influences the purchasing decision? ", let me share my opinion, based on over 500 research studies in the FMCG industry: the 'sensory VIRTUAL-REALITY loop'. From the moment customers LOOK at an ad, a packaging, a print, etc. online or offline, their sensory perception sets in motion and awakens emotions. Emotions are deeply anchored in our brains (limbic system) and linked to experiences/memories we have gathered in our lives with people, cultural habits, products,... These emotions are positive, negative or neutral and implicitly lead to feelings/actions, thus leading -in our case- to the interest in trying out a product or not. However, it is not just about emotions. Customers have a clear -subconscious- sensory product expectation in mind (e.g. about smell, colour, taste, foam,...) when they look at a packaging! All what is experienced and learned in life is stored in the subconscious (brand images, category scents, textures, tastes,...). When visually stimulated, our personal 'big data' and inner algorithmes pull out in milli-seconds the sensorial data expected based on our former experiences. => is the REAL product sensory experience identical/similar to the VIRTUAL product sensory expectation? b) NO = LOW chance of purchase, low chance of market success. 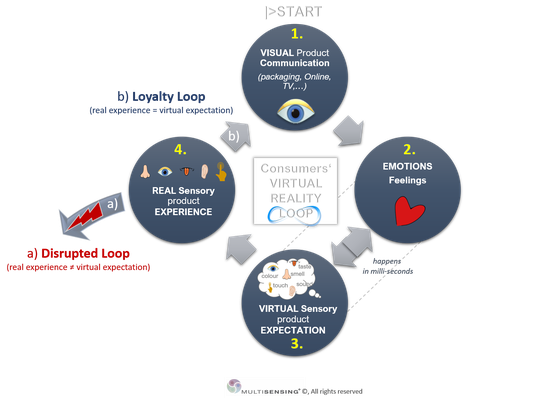 Increase your chances of market success by checking your emotional (sensory) consistency via the sensory virtual-reality loop!